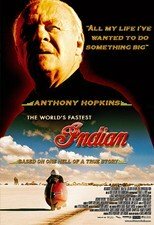 Believing that the custom-designed Indian motorcycle he has tinkered with for years is ready to compete in the 1967 Bonneville speed trials, over-the-hill loner Burt Munro (Anthony Hopkins) raises the funds to travel from his home in New Zealand to America. Based on the true story of Munro's inspirational odyssey, this adventure drama from writer/director Roger Donaldson ("No Way Out") also stars Diane Ladd, William Lucking, and Saginaw Grant. 127 min. Soundtrack: English.